Saturday was another busy day at Who Do You Think You Are? Live. I had three talks booked, as well as an Ask the Expert session, but otherwise had more time than Friday to wander around the stands and catch up with some friends. First up for me was “Your Irish Ancestors and the Law”, with Brian Donovan talking about the Petty Sessions order books that are available on www.findmypast.ie. The Petty Sessions courts handled most criminal cases in Ireland, apart from the most serious, and were held by Justices of the Peace without a jury. Record taking was made mandatory in 1851 and so only a few earlier documents survive. Among the order books are dog licence books (1850-1924) – every dog had to be licenced, and every farmer usually had a dog. Details include owner’s name, address, and occupation. Brian also discussed the Irish Prison Registers 1790-1924 on findmypast.ie, another great resource. 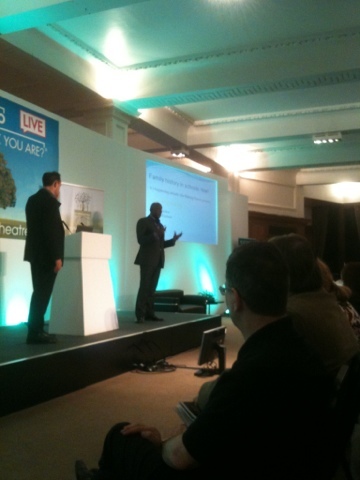 I really enjoyed this session as I learnt a lot and Brian’s a very entertaining speaker. I had a long break until my next talk and made the most of the time to chat with fellow IHGS students, and also to attend the inaugral WDYTYA? 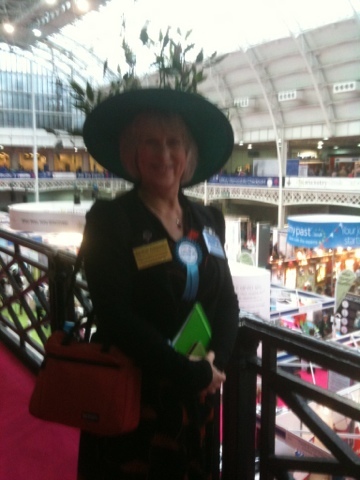 Live “tweet-up”, ably organised by Rosemary Morgan. It was a great chance to meet some of the people I’ve been following on Twitter, and to discover more folks to follow! My Ask the Expert session was with Kathy Chater who gave me some great tips on how to chase up details of my 3xgreat grandmother Elizabeth Rose, born in Cape Town in 1845. 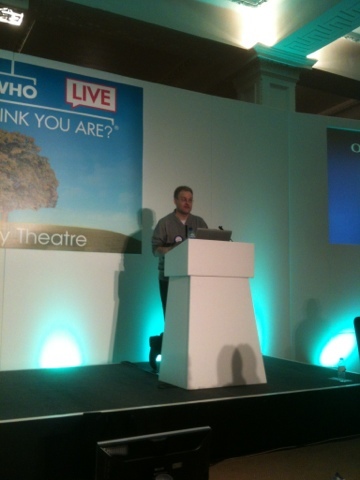 Nick Barratt’s presentation on the future of genealogy was interesting, and it’s apparently his last gig at WDYTYA? Live as he is moving back to the National Archives to head up their Medieval team (amongst others). Somehow I can’t see TNA keeping him away next year! I then raced around like a mad thing to pick up a Flip Pal (thanks for speedy service, guys!) and the second-hand books I had scored earlier and were being kept for me by the bookstall, before leaping into the last talk of the day – Rosalind McCutcheon on The Registry of Deeds in Dublin. Wow. What a resource! I’ve heard Rosalind talk before, and so I signed up for this without knowing how much the Registry of Deeds could be of use to me in my own research. It was a great way to end the day, and I am itching to get over to Dublin to start digging away amongst those dusty tomes. Handouts for most of the talks will be available from the Society of Genealogists website soon, hopefully. 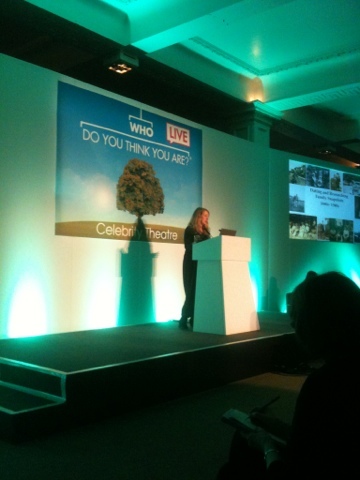 Last weekend I attended the Who Do You Think You Are? 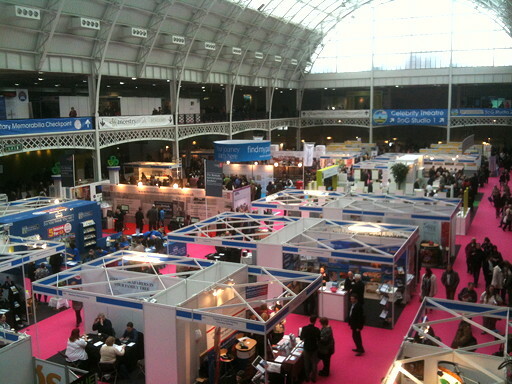 Live exhibition held at the Olympia in London. It runs for three days, and I went along for the Friday and Saturday. What struck me on Friday was how CRAZY busy it was in comparison to last year. I like going on the Friday, because I have this idea it’s a “quiet” day. Not so! I also filled up my time with four talks and the Keynote lecture with Q & A, so by the end of the day I was feeling rather overwhelmed. It doesn’t look that busy in this photo, but it was! 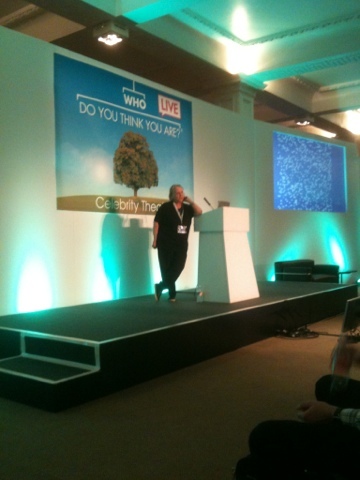 The most illuminating presentation I attended was Debbie Kennett’s “A Beginner’s Guide to DNA”. A fellow IHGS student and I raced into the Olympia to get seats for her 11am session, and were not disappointed. Debbie gave a clear and concise overview of the three main tests you can take : Y-DNA (males only), mtDNA and Autosomal, and explained how they can be used for genealogical connections. I found it completely fascinating and now want to get everyone in my extended family tested! In my Ask the Experts session I scored Dominic Johnson as my expert, and wished I had brought along my palaeography assignments instead of a question about my South African ancestor! Last year I had been inspired by her workshop on palaeography. One of the best parts of the day was chatting to the staff from IHGS, and catching up over dinner with fellow students. Today I enjoyed a lovely lie-in and leisurely breakfast at my hotel, before heading home by train. I would have loved to have visited WDYTYA? Live for a third day, but had afternoon commitments. Next year I will clear my calendar for the weekend! Best decision I made this year was my choice of hotel which was only a five minute walk from Earl’s Court tube station, and on the way to the Olympia. So this meant I could travel up on Friday morning by train, drop my bag off to the hotel, and then it was only another ten minute walk to the Olympia. Genius! I had splashed out on platinum tickets for both Friday and Saturday, which is an expensive way to do it, but it was worth it. I just wish they had some kind of deal for a three day platinum ticket! Maybe next year? I spent a lot of my time in workshops. Unless there are some special deals that are show-only, I tend to buy books/products online. (I am still regretting not buying a Flip-pal, though!) So I think it’s really the talks and presentations that make it worthwhile for me. This year I got to meet up with a couple of friends as well, which was fantastic, as in the previous two years I’d attended on my own. It was also lovely to hear talks by people I’ve heard/read about, and to see them in person. One thing I meant to do last year was join the Suffolk Family History Society, and this year I finally did it! It’s the first FHS that I’ve joined, so I’m hoping for great things to come of it. I managed to snaffle a FindMyPast polo shirt – score! Plus track down Else Churchill for a genealogy blogger/tweeter rosette (um… sorry I hassled you straight after your presentation, Else!) Maybe next year it would be a good idea to have a central point to pick one up (the SOG stand, perhaps), to save us stalking poor Else? I was looking forward to today as I was meeting up with some of my fellow IHGS students. They are a bit further along in the course than me, and as hoped, I am now all fired up to crack on with my next assignments! However, on with the event – I got some extra workshop tickets today, and the first talk I attended was Audrey Collins’ on TNA’s new Discovery service. Despite numerous technical glitches, it was an interesting and useful presentation. Looking forward to getting back to my laptop and doing some searches. Next up was a comparison of parish registers and bishops’ transcripts in Wiltshire from John Hurley. I’m about to tackle these in my next IHGS assignments, so good timing! Yesterday I spent some time going around the different stands downstairs, but today decided to mainly spend my time at the workshops instead. I bought a ticket for the keynote talk with Laurence Harris (unfortunately forgoing Bruce Durie’s presentation on Heraldry), and was a bit disappointed – not sure what I had expected, though. Perhaps something pitched at a slightly higher level? The Q & A session that followed was great, however. D.Joshua Taylor (brightsolid US), Dan Lynch (Google), Lisa Louise Cook (Genealogy Gems), Peter Christian, and Paul Howes (Guild of One Name Studies). And then for a bit of light relief (and some excellent info), there was Chris Paton on doing Irish research online. Great craic altogether! I had an Ask the Expert session booked after this – I got some useful guidance on where to go next in the hunt for my Burkes in Mayo, but I wonder if I might not have come up with it myself given half a spare moment. Always nice to have someone’s undivided attention for 20 whole minutes, though (not something I’m used to with three young kids). 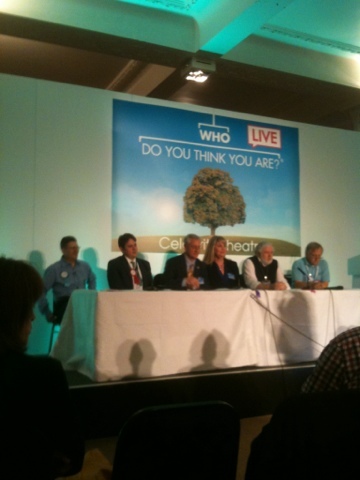 By this time I was in WDYTYA Live overload. Had a quick covetous look at the Flip-pal, and then legged it to the pub. My iPhone doesn’t take great photos and I can’t tell if any of the above are very clear, but am posting them ás is’ for now and fixing them up later when I get home. Couldn’t believe how busy the place was today! I arrived just before opening time of 10am and the queue of ticket holders outside seem to go on forever. It was at this point I was very glad I had splashed out and got a fast track platinum ticket, which enabled me to bypass the queues and go straight inside. I managed to grab some extra workshop tickets upstairs,and then I headed straight for the photo-dating area, where my luck was in! Maureen Taylor dated four photos of mine before there was anyone else waiting in line (top tip: head for the photo dating area first). 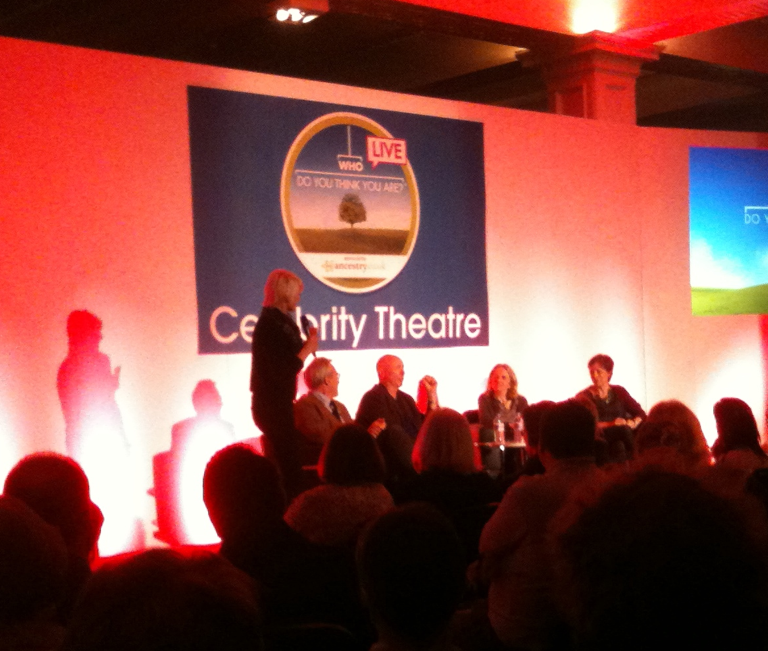 The first talk I went to was Larry Lamb sharing his experiences of WDYTYA. His episode was voted as the most moving of the last series, and it was lovely to get his feedback on the whole process. After that session, I grabbed something to eat and prepared my information for the Ask the Expert session I had coming up next. I spoke to a very helpful man about my military ancestors and found out where to look for further information. A visit to TNA at Kew seems to be in order! I then had four talks/workshops in a row – all of them illuminating. Nick Barratt (along with Colin McFarlane) spoke about an amazing project they’re working on with school children, integrating family history with the national curriculum. (Can’t check website address right now, but will add as soon as I can!) Jayne Shrimpton showed us family snapshots from the 1880s to the 1940s, giving us ideas on how how to date them and also proving what value they have to our research. Last session of the day for me was Discover Scottish Church Records with Chris Paton. Essentially a Quick History of the (surprisingly many) churches in Scotland, with helpful hints on where to research, all delivered with great humour. Lovely way to end the day! WDYTYA? Live ~ one more sleep to go! Who Do You Think You Are? 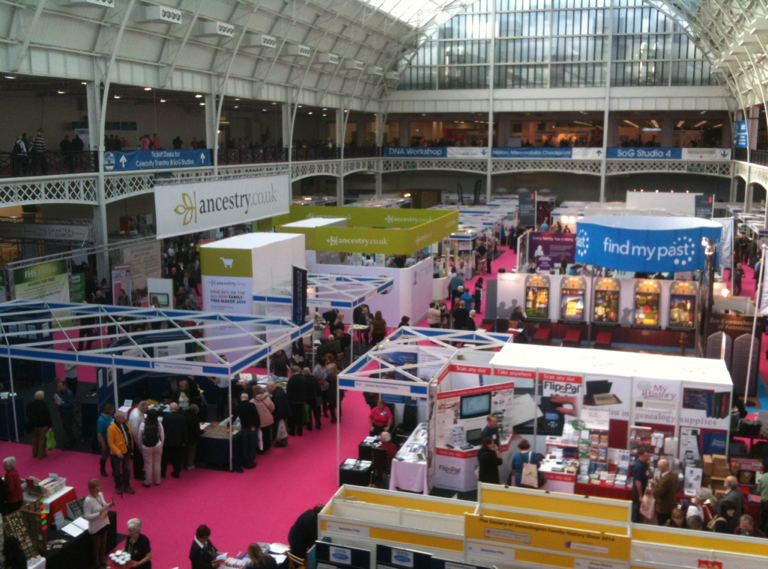 Live, the biggest family history event in the English-speaking world, begins tomorrow! Apparently the District Line between Earl’s Court and Kensington Olympia is on a restricted service on Friday, so if you’re going along tomorrow, check the Transport for London website, for an alternative route. The walk doesn’t look too bad from Earl’s Court, though – about 15 minutes. Service seems to be running normally during the weekend. 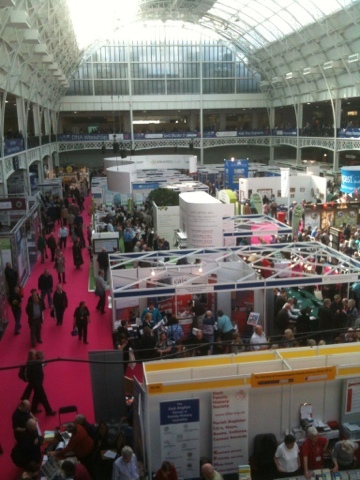 Many of the exhibitors are running competitions and promotions. One that caught my eye on Twitter was FindMyPast – visit their stand 707 and quote “the transcription has landed” for a free 1911 census polo shirt. First come, first served! The Institute of Heraldic and Genealogical Studies are at stand 69/70, with a great discount on their Correspondence Course if you enrol this weekend. Check out all their other courses too, and have a chat to the lovely staff. I’m not sure what I’m more excited about – the actual exhibition, the workshops, meeting up with some fellow IHGS students, or having a weekend away from the kids! Hopefully I’ll get a chance (and an internet connection) to post tomorrow night. I had planned to tackle some filing today, but I seemed to have found a myriad of things to do instead! I’ve just installed a WordPress plugin called Organise Series, so that it’s easier for my readers to follow a series of posts that I write on a particular topic. My Brosnahan posts are ideal candidates for a series, so I went ahead and set it up, but the series links box that is added to each post needs a bit of work, appearance- and placement-wise, so have turned the feature off for now. If you’re interestd in adding this plugin to your blog, check out Moultrie Creek’s article, which is where I got the idea from. This week I need to spend some time preparing for WDYTYA? Live. I have two ‘Ask the Expert’ sessions, where I get to spend 20 minutes with an expert who will hopefully tell me all the answers what steps to take next in my research. The two areas I want help with are tracking down my Burke ancestors in Mayo, and finding the regiment and movements of a military ancestor. I want to collect together all the information and research I’ve done so far and type up a summary for each question. I’d like to follow up a little more on my Brosnahans, plus tackle some of my neglected IHGS assignments. I’ll get a chance to see my tutor at WDYTYA, so better do some work before I go! Tomorrow I may do some filing. WDYTYA? Live ~ one week to go! 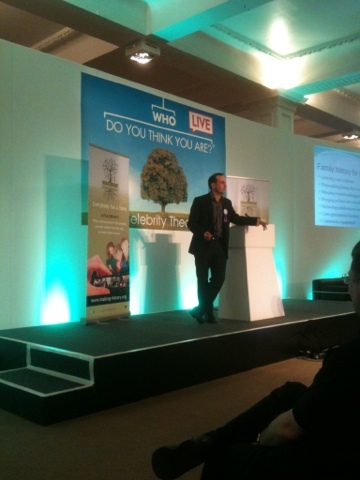 This time next week I will be at WDYTYA? Live in London! I’m attending on Friday and Saturday, and have booked workshops for both days. I’m hoping I’ll be able to pick up tickets on the day for another workshop or two. Ancestry have announced they will be streaming some of their presentations live from their Facebook page. (You’ll need to have a Facebook account.) Details are on their blog. There are three presentations on Friday and three on Saturday that you will be able to view.